This is truly the first glimpse of what Audi is working on for the RS3. Photochops and renderings aside, this is the real deal. And where else would Audi be testing their latest RS car? The Nurburgring of course. Apparently caught testing the same day as the RS5, this test mule looks more like a car ready for production rather than a camouflaged mess of aerodynamic experiments. Basically, this mule is an S3 with the RS3's new powerplant. 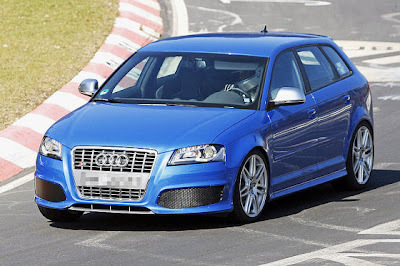 Word is, the RS3 will be equipped with the same 2.5 liter, 5 cylinder turbo found in the Audi TT RS. Power should also be the same as the TT RS, coming in at 340 horsepower and 332 lb/ft of torque. Considering both the RS3 and TT RS will both be equipped with Quattro all-wheel drive and will most likely weigh close to the same, performance should be very comparable. Look for a 0-100 km/h run around the 4.6 second mark set by the TT RS.